Analysis of the 6 years of GLOBE at Night showed that on average, the people who participated in GLOBE at Night saw brighter skies and less stars over time. The analysis was done by examining separately each of the limiting magnitudes (1 through 7) over all of the campaign years. 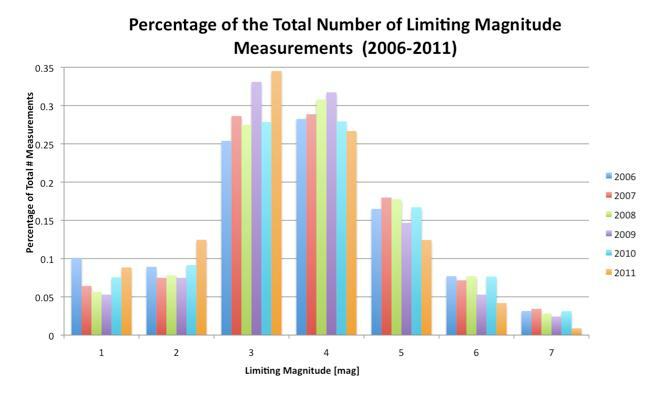 Each of the limiting magnitudes corresponds to each chart (1 through 7) used in the campaign. The brighter the sky, the lower the number. A Chart 1 measurement (or Limiting Magnitude 1) would be what you would expect from New York City. A Chart 7 measurement (or Limiting Magnitude 7) is what you would expect from a national park. Looking at the percentage of total number of measurements taken, binning those percentages in terms of the limiting magnitude (or chart number), and then color coding by year, produces the histogram in Figure 1. Looking only by limiting magnitude over the years, trends can be seen in all of the limiting magnitudes. For the most part, Limiting Magnitudes 1, 2 and 3 (brighter skies) slope upward (with the exception of Year 2006 for Limiting Magnitude 1). This means the skies on average were brighter for the people who submitted that GLOBE at Night data. For the most part, Limiting Magnitudes 4, 5, 6 and 7 (darker skies), slope downward. This means the skies on average were less dark for the people who submitted that GLOBE at Night data. One caveat to note is that since the same people do not necessarily participate in the campaign each year, it is hard to get data from exactly the same locations. It could be that there was a higher fraction of urban participants as time went on. However, on average over the 6 years, 85% of the measurements have come from the United States and Europe.